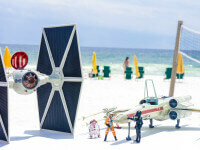 Visitors come to Hilton Sandestin Beach to spend their days basking in the sunshine and enjoying some beach time. But many don’t know how much there is to do in the area after the sun goes down. Sandestin nightlife has much to offer — from bars and restaurants to movies and more. Below, some of our favorite things to do in Sandestin after dark. Sandcastles Lounge: Sandcastles Lounge is the place to be at night. 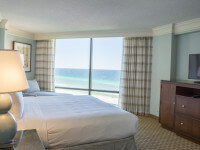 Located within Hilton Sandestin Beach Golf Resort & Spa (next to the lobby), the lounge is open to hotel guests, local residents or visitors to the area. With big screen TVs and a full bar, it’s the perfect place to catch a game or enjoy cocktails with friends. Sandcastles also serves a great selection of lounge fare — including quesadillas, wings, burgers, and sushi from Hadashi Sushi Bar. The Lounge serves food until 11pm, and will stay open as late at 2am on weekends. Baytowne Wharf: Take the complimentary resort shuttle over to The Village of Baytowne Wharf, and enjoy a selection of bars and restaurants that are open late into the night. There’s something for everyone — Fat Tuesday Daiquiri Bar is a classic New Orleans frozen drink bar, Rum Runners has dueling pianos playing all the hits, and John Wehner’s Village Door Nightclub is the area’s only dedicated live music dance club. 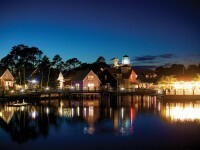 Baytowne Wharf is a hub of Sandestin nightlife. Please note, the complimentary shuttle service runs until 10pm on weekdays and midnight on weekends. To get back to the resort after hours, use C2 transportation or OK Taxi. Grand Boulevard: A five minute drive from the resort (our shuttle will take you there! ), Grand Boulevard is home to a movie theater and the Ovation Dining Club. The Ovation Dining Club takes dinner and a movie to a whole new level. Movie-goers sit in plush, high-backed reclining chairs and enjoy a full-menu of drinks and food brought right to their seat by the theater’s waitstaff. It’s one of the best things to do in Sandestin at night! Pool Deck: Our pool deck is also a great place to relax and unwind after dark. Our staff is happy to light the fire pit adjacent to Barefoot’s Beachside Bar & Grill so guests can enjoy the beautiful night sky, and the peaceful sound of ocean waves. For the Kids: Don’t forget about the kids! At Hilton Sandestin Beach, our Kids Krew programs extend into the evening with Kids Night Out (offered spring break though Labor Day). Kids Night Out activities include camp-outs on the beach roasting marshmallows over a bonfire for s’mores, searching for constellations, secret-agent training, pirate parades and pajama parties with pillow fights. The program is offered 6-10pm Monday through Saturday, and the cost to participate includes dinner and a T-shirt. The Gulf Coast of Florida may be famous for it’s sunshine and sunny days, but there’s plenty of things to do in Sandestin when the sun goes down, too!